Want confirmation: I am getting a TI-99 4/A QI power board to replace the one we have. Ours is a black and silver console. Will it still be compatible? Possibly. Some of the earlier black & silver models (as shown below) had a pigtail type power connector instead of connector pins, the later black & silver models had the same standardized connector as the beige models. The picture you show, that's what you refer to as a pigtail? The 4 pin Molex cable? The replacement power supply xabin refers to is the Radio Shack/Archer-branded QI supply (new-in-bag) and has the 4 pin header on the board. The alternative was a non-QI supply board (taken out of a working beige console that was sacrificed for parts) also with the same 4 pin header. Yep, the later boards all had the pins as a plug-n-play arrangement, this type would not work without a little soldering. Once hooked up it would work just fine. My guess is that he has at least an 80% chance of having a 100% compatible ready to plug in version. Edited by Flottmann1, Wed Mar 20, 2019 10:12 AM. Okay. We hope it can screw into the right area, alright. Thanks for the confirmation. Is the TI an 8-bit or a 16-bit computer? My boyfriend can't remember; he thinks it's technically a 16-bith but not a true 16-bit, if that makes any sense. The TI-99/4A computer is a true 16-bit computer. The fact that the data bus is folded on the board (transports two bytes in succession instead of one 16bit word) has no meaning for the architecture of the system. As I already said some time ago, the Intel 8088 CPU is correctly referred to as a 16-bit CPU, but it only has 8 data bus lines leaving its package (same principle, just inside the CPU). Edited by mizapf, Wed Mar 20, 2019 1:39 PM. There is one caveat. Beside the pure technical fact (which clearly implies the 16 bit nature), there is also the perception of something we could call an "n-bit era". People with lower technical background associate certain capabilities with those eras that are in fact not directly implied by the CPU architecture. We know how computing looked like in the 8-bit era with the typical systems like C64, Spectrum etc. People perceived the following 16/32-bit era as computing with a whole bunch of new possibilities; examples given by Commodore Amiga, Atari ST and so on, and the professional world of "IBM-compatibles" with 16-bit CPUs. The problem is that the architecture width may be exploited to achieve new capabilities, but at the end of the day, you need a lot more than a CPU. On the hardware side, there are graphics, memory, peripherals; on the software side you need adept people. The TI-99/4A obviously was the first 16-bit computer reaching private homes, but it lived in the 8-bit era, and never really stood out. So, we got the replacement power supply board for our TI (thanks so much to PotatoFarmer for helping us out with that, and other things he sent us), but we're still getting no signal. We're getting white static that fades, eventually, to black, but no beep. So we think either the motherboard is fried, or the cable for the power supply (external) is fried (since it's a bit frayed). 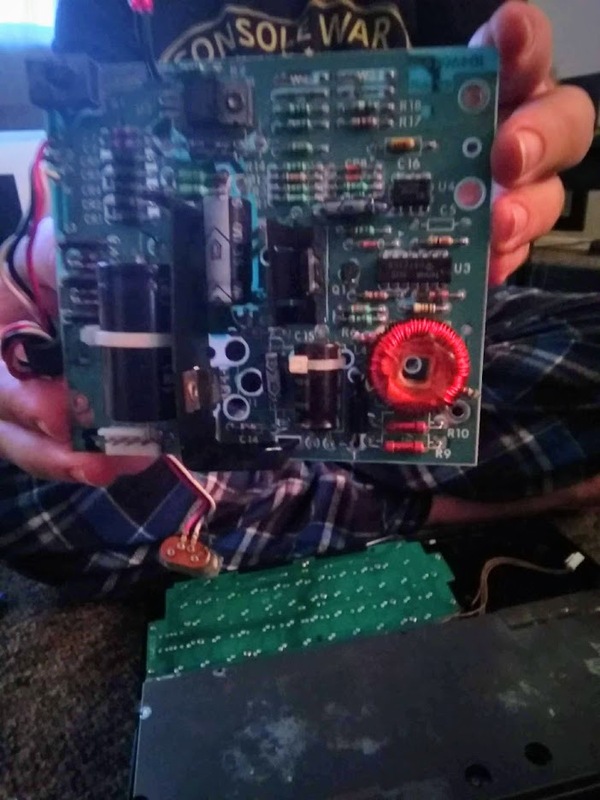 We're going to take it down to my boyfriend's dad to look at it (he knows about electronics), and if he can't fix it, we'll see about taking it to that local game store we mentioned. One thing we did notice that was different from the previous attempts; now, it resets like normal (but to a black screen with no beep) when it's on and a new cartridge is inserted into it. Hopefully this'll help. Edited by xabin, Sat Mar 23, 2019 12:46 PM. Blegh, we missed the obvious; there's a big chunk of the wiring for the power cord that's been stripped to the wire, and that has a few places where it looks rusted. That should be an easy fix for my boyfriend's dad, right, if he's good with fixing basic electronics? Well, we can't do that kind of repair, sadly, if it is that, but we can fix the power cord, if that's the issue. Note also, that it is actually cheaper to buy a spare machine to use as parts than it is to buy the parts individually. Examples: The machine works fine electrically (good display output) but the keyboard is bad--your machine has a good keyboard (and now a good internal power supply), which would give you a single good machine when combining the good parts. Any spare good parts are useful too, as they will help in the event of future problems. I think most of us have several machines around just to be able to resolve such problems quickly. . .
but I have 2 much more difficult to get 99/4 that will not work, it is worth repairing for them ! Edited by Flottmann1, Sun Mar 24, 2019 9:39 AM. I understand that. The thing that makes us leery about changing out the chips in it is that we're getting some sort of signal, it's resetting when we put a cartridge in it, and there's no beep when we turn it on, and I read that black screen plus long beep is a good sign that chips are dead. We have two options: we're going to try and get the cord repaired by my boyfriend's dad, and see if that fixes it. If not, we're going to take it down to the retro gaming store that said they might be able to fix it, and see what they can do. Only if they can't fix it will we look into getting a used motherboard for replacement parts. We really don't want to ask for any other parts from others on here, since FarmerPotato's been much more than generous with helping us (seriously, we wish we could repay what he gave us for free), but if this doesn't work, and we need to resort to chip-switching, we can try to buy something off of you guys. You would actually be switching out the whole motherboard as a unit, as almost all of the chips are soldered in on the motherboards. @Flottmann1, you are right that getting a 99/4 back to working is definitely worth it. Yomight want to check with Xad Nightfall (I believe he is in Italy), as he has a lot of recent experience repairing motherboards. In Germany, Jürgen Stelter used to do a lot of console repairs, but I'm not sure whether or not he is still doing so. So, we'd have to get a working motherboard. Erf. Well, as I said, FarmerPotato has done so much to help us, but we don't want to abuse his generosity. We are willing to buy the part, if we can (we're on a very strict budget and can't do much as far as big purchases, but if the price is right for the motherboard, we can negotiate a deal on it). I don't think the guys at the game store who said they'd work on it has a replacement TI board, so buying it and installing it ourselves would be the best option for us. Edited by xabin, Sun Mar 24, 2019 3:12 PM. There's a fairly good chance someone here has one they could part out as some of the guys here have more consoles than you can count on both hands. Okay. As I said, we don't have a whole lot of money to part with, but we can try to negotiate a deal for the motherboard. We don't want to ask for a freebie, again, since we feel like we've taken enough of you guys' generosity for granted. Also, instead of a black screen with no beep, we are now getting bright white static/snow with no beep, and with the computer restarting when we put in a cartridge while it's on (which I'm told it's supposed to do, when that happens - the resetting, not the static), so... dunno if that helps. The no beep might be a good clue though.. the sound generator requires nothing more than a working clock to start making that obnoxious sound. I'd look at the VDP first (which provides the audio clock) - coincidentally, it's also the most common subsystem to fail. Apologies if you're past that already, I didn't read the whole thread.